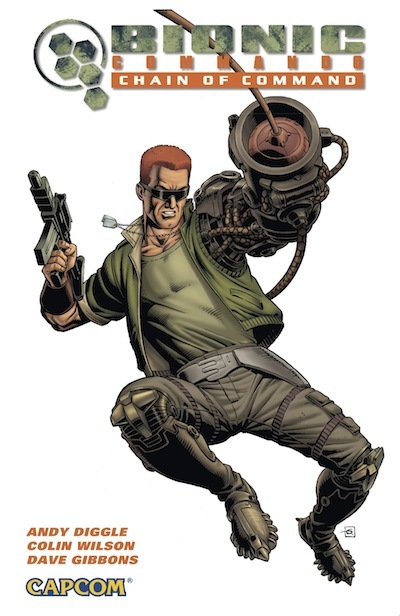 When Captain Nathan "RAD" Spencer's left arm was lost in the line of duty, he was literally re-armed with a powerful bionic prosthetic. Equipped with a prehensile grappling claw, capable of lifting many times its own weight and even hacking enemy computer systems, it turned one man into a one-man army. In 2030 A.D. the Federal States of America were almost overrun in a military coup by Imperial forces, who had captured top FSA agent Joseph "Super Joe" Gibson. A lone mission by Captain Spencer -- call-sign "Bionic Commando" -- succeeded in rescuing Gibson, and thwarted the Imperials' plan to activate the mobile weapons platform known as the Albatross. Now, five years later, the world at last knows peace. Or at least, so it seems. But the FSA is fighting a new war -- a secret war -- and everything Spencer believes in... everything he trusts... is about to be turned upside-down.